Liverpool FC are delighted to announce the signing of 20-year-old Serbia international Lazar Markovic from Portuguese side Benfica. The versatile attacker, who is capable of excelling in any forward position, joins the Reds on a long-term deal after a season of remarkable success with the Lisbon-based club. Markovic clocked up 49 appearances during the 2013-14 campaign and contributed seven goals as Benfica sealed a domestic treble and reached the Europa League final. Having quickly graduated through his country's youth ranks, the Cacak native made his international debut in February 2012 and is now a regular for his national team. He becomes Brendan Rodgers' fourth signing of the summer to date, following the confirmation of Rickie Lambert, Adam Lallana and Emre Can as new players for next season. After completing a medical and the formalities of his switch at Melwood, Markovic told Liverpoolfc.com: "I am very happy that I have joined such a great club. "I hope that I will fulfil the expectations of the supporters, coaches, players and all connected to the club. I have seen what the players are like, I have seen what the supporters are like, and I cannot wait to start playing here." I hate you. It was supposed to be my player-thread-comeback! This thread was miiiiiiiiiiiiiiiiiiiiiii iiiine! My precious! Ok then, welcome to the club, Lazar! Very excited with this signing, was hugely impressed with him in the UEL last season. Nice to see we got him the proper kit. Welcome to the club. Hope you fulfil your potential. "I went to Partizan and won the title. I went to Benfica and won the title. Now I have joined Liverpool and want to win the title, 100 per cent." Welcome Lazar! Knuckle down, work hard and go well! 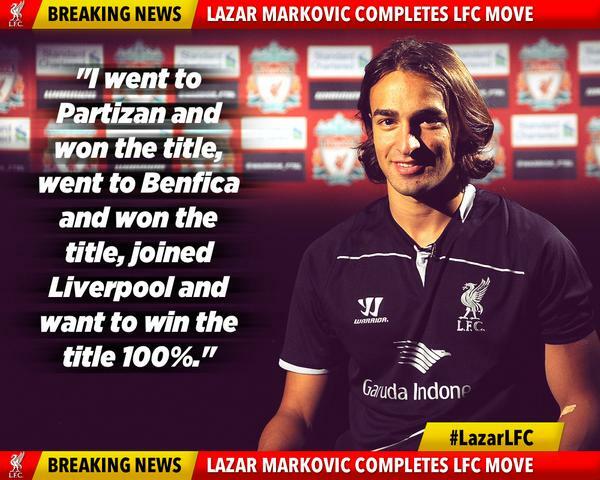 Liverpool have completed the £20m signing of Serbia international winger Lazar Markovic from Benfica. Markovic, 20, becomes the club's fourth signing this summer. A former Partizan Belgrade player, Markovic helped Benfica win the Portuguese title last season after joining the club in the summer of 2013. Liverpool have already signed Rickie Lambert and Adam Lallana from Southampton and Emre Can from Bayer Leverkusen. Just so long as he doesn't bugger off after winning it with us. He isn't much of a talker, is he? Finally, what would your message to Liverpool fans be? I went to Partizan and won the title. I went to Benfica and won the title. Now I have joined Liverpool and want to win the title, 100 per cent. I could live that actually. Really excited about this signing. Brilliant signing, top move by the club, look forward to seeing the skills because He's exciting to watch. Great to see we've finally got this done. Will he be able to play tomorrow .. paperwork wise not fitness ? Our most exciting signing so far. Big upside and potential and already has some impressive attributes, pace, vision and passing (from the little I have seen on the vids anyway). Welcome to Liverpool, hope you are as good as people seem to think you are and you become the player people think you might. I think he might become the answer to our transition problems and hopefully get us a few goals too. Maybe too soon to say he is the new Steve McManaman... but we can hope. It will be great when he returns to Lisbon on Champions League against Benfica this year! Welcome to the club Lazzy lad. Fantastic news! Welcome to the greatest Football Club on planet earth Lazar. May your beam shine brightly across the EPL and you light up Anfield during your time here. Pretty excited by this signing! Markovic looks like her can become a top player. That quote about winning the league is epic. at what point do we insert a clause not allowing him to go to Real or Barca. Bit disappointed actually I thought Spurs would have made a late bid for him. Another young talented player it's looking good so far . Kid's fast as f**k by the way.